Chefchaouen is most famously known as the Blue City. 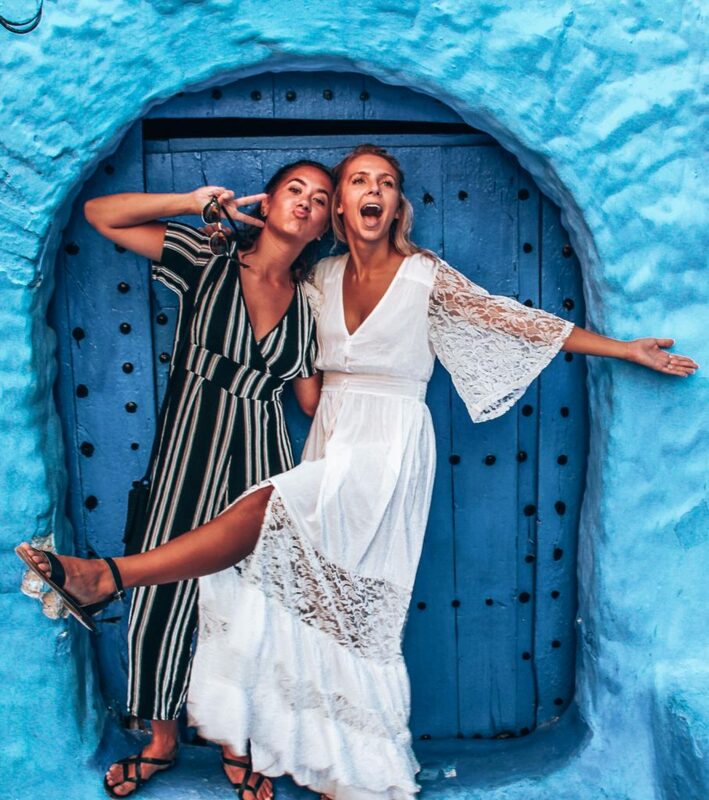 It is one of the most Instagrammable places in Morocco and is full of cute shops, friendly locals, and winding blue alleyways. Before getting your perfect ‘Gram shot in Chefchaouen you need to know a few things about the blue pearl. Like this photo? Don’t forget to Pin it! Chefchaouen is accessible by bus from both Tangier and Fes. It was the second stop on our trip through Morocco after Tangier (we then continued to Fes). The CTM bus and Supratours run to and from Chefchaouen daily. I recommend purchasing your next tickets from the station when you arrive in Chefchaouen, as you will have to walk back to the station to purchase them. The lines can be long and as Chefchaouen is a popular destination, busses can fill up. Purchase in advance! This was a great experience and something I would totally recommend. I’m not usually one for hiring tour guides (I sometimes join free city walks). But Chefchaouen is such a winding city that a guide was helpful and taught us lots about the history and culture of the city. Our tour guide, Amina, is the only female tour guide in Chefchaouen, and she was awesome. This is her Instagram if you want to get in contact with her. (Not an ad – I just really liked her!) Whoever you choose – be sure to ask lots of questions! Honestly, this is the best thing to do in ANY Moroccan city, but especially in Chefchaouen. To get that perfect Insta-shot, you are going to want to wander long and hard my friends. Crowds can be thick, and there are of course the famous ‘steps’ to take photos on – but there are tons of different alleyways as well. There are several different shades of blue to be found. Get lost. Take your camera. Wander around. It will be worth it and this is where your best photos will come from. The view over Chefchouen from the Spanish Mosque at sunset. If you’re up for a small hike, the walk up to the Spanish Mosque on the outside of town is well worth it. It takes about 30 minutes of strolling to get to the top, but the view about halfway up is just as pretty. We stopped there in order to not fight the crowds and were greeted with a small wooded area and a stunning sunset over the city. Mountains were the backdrop for the city, and it was well worth the walk. Just before the walk to the mosque is a small set of waterfalls. This is where the women do their laundry and kids and some men splash in a little swimming area. (Sorry no women allowed). This is a great place to sit and have an orange juice and just people watch. The area is usually bustling with people selling merchandise, peacocks, a few donkeys, and kids running around. I did not experience this hammam for myself (though we did experience one later on) – but I have heard that the Hammam in Chefchaouen is the real deal. It is a true traditional Hammam, and while it won’t be a ‘spa’ experience – is well worth the time. It shouldn’t cost you anything more than 11 dollars and will be an experience of a lifetime. If you want to read more about the hammam experience, I absolutely loved this article from Emily Style. Both hilarious AND educational- my favorite! There are several hikes just outside of town if you are visiting for more than just a few days. We weren’t able to go on any due to time, but I have heard that the Bridge of God hike is awesome. If you have time to do it, please send me a message and let me know how it was! I loved this little cafe/ restaurant down a little alley. The upstairs overlooked the street where we could watch kids hit each other with a stick (how fun!) There was a cute balcony where we took some pics and had a good time. The food was delicious and I would totally recommend. This cafe doesn’t look like much, but the staff was super friendly and the food was really good. Plus there are tons of cute cats roaming around, one decided she was going to cuddle me and love me forever. 10/10 for cats and food. 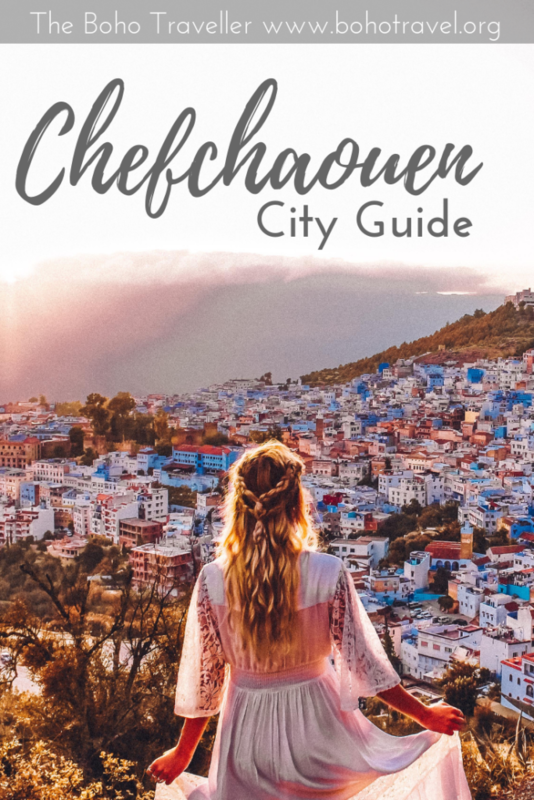 Chefchaouen is a very different place from Marrakech, Fez, or even Tangier. The city is very small and the people are super friendly. So friendly in fact that some boys asked me to film them doing backflips and post it on YouTube! They gave me a hug and they didn’t speak any English and I didn’t speak any French, but I have a feeling we became close friends that day. 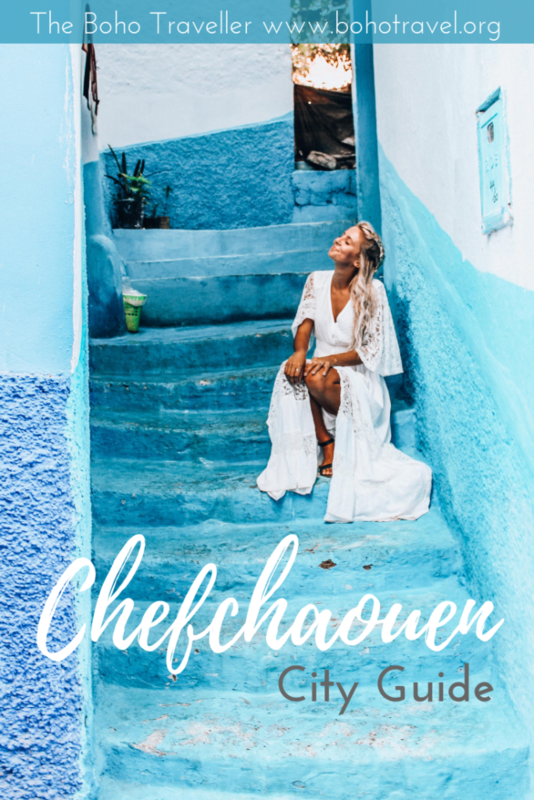 Chefchaouen is a place where you can let your guard down a little bit. I’m not saying be a target for pickpockets – but chat with people. Start a conversation. You never know you who might meet! Even French Montana filmed a music video in Chefchaouen, as did Daddy Yankee. Liked this post? Don’t forget to Pin It to save for later! Just click the little P in the top left corner of any photo!